Shoreham-Wading River High School is located approximately seventy miles east of New York City on the beautiful North Shore of Long Island. The State University at Stony Brook and the Brookhaven National Laboratory located nearby offer a myriad of resources and opportunities for higher learning, research, internships and employment. Our district is comprised of three elementary schools, one middle school and one high school. Exemplifying unity, the new district organized committees made up of community members to provide input on major areas of the future high school program. 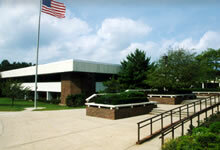 The district chose architects and involved the professional staff in preparing preliminary designs for the new school. Due to increasing student enrollment throughout the early part of the 1900's, several multi-district reorganization plans were discussed to meet the anticipated need for a secondary school during the 1960's and 70's. On July 1, 1973, the Shoreham-Wading River Central School District No. 1, Town of Riverhead and Brookhaven, was created. During this same year, a new middle school opened its doors to students. On October 24, 1973, resident voters approved the funds for the new high school and building began. The high school opened its doors to students in September of 1975, and sits on 40 acres of land given to the district by the federal government. The very foundation of the Shoreham-Wading River High School rests on the concepts of unity and progress. Unity was chosen because the school was the result of the first collaborative effort between Shoreham and Wading River, in the education of their children. Progress represents the connection between the past and future of the school. Shoreham-Wading River is a secondary school with an enrollment of approximately 800 students in grades nine through twelve. Students with vocational interests have access to several BOCES centers for training in highly specialized and technological fields of study. The high school is the center of the community. The public library, community fitness and nautilus center, exercise trail, evening tennis courts and community athletic fields are incorporated in this sprawling sixty-acre high school campus. The high school library is an active state of the art program with 60,000+ volumes and 30 computer stations for reseach. The library program prides itself on supplying primary source materials and a critical thinking skills curriculum. Our computer labs are equipment with 20-30 computers in each lab. Programs include word processing, spread sheets, databases, computer aided design, desktop publishing, and multi-media software. . A more detailed technology initiative is available.